Gracie is really into My Little Pony Equestria Girls since watching the Rainbow Rocks movie earlier this year. She collects the dolls and has plenty on her list to Santa this year. The Equestria Girls movies are really nice films that she can happily watch alone in her bedroom when she wants to. All of the problems the girls come across can be solved by the power of friendship, which is how we all know My Little Pony to be and is definitely a lesson I want Gracie to take note of! The Friendship Games is a typical sporting and academic battle between schools and is held every 4 years. This years Friendship Games brings a shocking and familiar face from Crystal Prep Academy. Canterlot High meets it's rival school, Crystal Prep Academy, in a competition that's a long-standing tradition- The Friendship Games! Sunset Shimmer is tasked with keeping the games magic-free to avoid the appearance of impropriety while she and her friends compete against Crystal Prep's top students led by someone with an equal amount of interest in Equestrian Magic- this world's TWILIGHT SPARKLE! We watched Friendship Games on Friday for our family movie night and Gracie and Zach loved it. There are plenty of fun songs like the previous Equestria Girls movies. Gracie loved seeing the Equestria worlds Twilight Sparkle and Spike, they are great additions and they thought it was so funny when the two Twilight's meet at the end. It was also great to see Sunset Shimmer playing such a big part as she is Gracie's favourite Equestria Girl. Also if you or your child are My Little Pony fans you might spot every fans favourite DERPY! She briefly stars as an Equestria girl at Canterlot High. 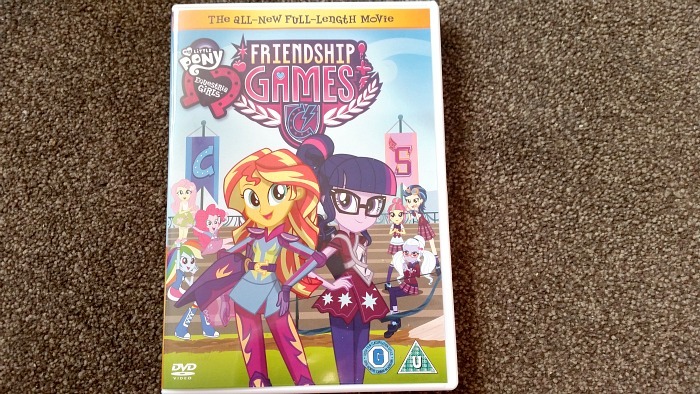 My Little Pony Equestria Girls: Friendship Games is available to buy now on DVD and Digital Download.